Now that you know a little bit about what a Mini Mark means, here’s a listing of Marks and their differences. The following covers the most common Minis; i.e., those built in the UK. The ones built there for the UK market make up about 46% of the 5.3 million Minis built. You can be reasonably safe in extending the information in this article to Minis built in the UK for export sale, or those built in the UK as CKD (Completely Knocked Down kits) that were assembled in other countries. There are exceptions, but they are few enough. This accounts for another 46% of total Minis. So, figure 92% of all the Minis built were done in the UK and will follow the Mark system to some extent. You’ll also notice that the Mark years overlap. Major changes were during a year, not conveniently at the beginning of a year. So, you can have a 1967 Mk II and a 1968 Mk II because the Mk II Minis were offered to the public starting in October 1967. The lesson here is that knowing your car’s Mark is only one (incomplete) method of identifying it. Knowing when it was built can be more important. When discussing with your buddies the differences between Minis, the Mark system is handy. It helps when buying parts, but is of no use when facing an inspection for importation of a car to your country or to meet emission or safety requirements to get the car licensed and on the road. In those cases it is best to know the build date. The dates listed below generally follow the dates the “Marks” were introduced for sale to the public, not necessarily the date a particular change was made on the manufacturing line, nor the date the cars may have appeared at a manufacturer’s car show. The first two dates are usually close enough for most purposes. (Knowing the Chassis Number or VIN becomes important – see “Identifying Minis by Chassis Number/VIN – Standard Cars.”)For instance, an October release date may mean that the assembly lines actually started producing the new Mark in August or September. You can explore our Mini Mark decision tree (“Matrix for Identifying Minis by Mark”), or follow along with the narratives below which are listed roughly in date order. ADO 15 (for Austin Design Office model 15) was introduced to the public in August 1959 in standard saloon/sedan form under the Austin and Morris badges as the Austin Seven and Morris Mini Minor. The Seven name was dropped early during the Mk I run and the Minor name only lasted until the end of the Mk I Minis. The cars became simply the Austin Mini and Morris Mini. Some countries, like the U.S., received the cars badged as Austin 850 and Morris 850. During the eight year run, there were many detailed changes up until October 1967 (when the Mk II took the Mk I’s place). New models were introduced. Interiors changed. Exterior paint schemes and trim changed. Seven different engines were offered. Two major suspensions. Five different braking systems. The list is lengthy. Common to all the Mk I Minis were the exterior door hinges, sliding windows, smaller oval tail lights, and the rear, swinging license plate holder. There were more than half dozen grille variations but they all had the moustache and whiskers surrounding the half-oval grille attached to the body only. The gearboxes had many internal variations and improvements, but were always four speeds with no synchromesh on first gear. The 848cc engines used the “magic wand” gear shift with the long lever coming out of the floor towards the front of the foot well. The Cooper and Cooper S used the remote shift mechanism with the lever back between the two front seats. An automatic gearbox was introduced as an option in May 1965. All the saloons changed to the hydrolastic suspension starting in September 1964. This commonly called “wet” suspension was originally intended for the Mini right from the beginning, but that didn’t happen, and it was introduced on the ADO16 cars first (1100s). Front brakes for cars with the 848cc engine went to dual leading shoes in September 1964; although, they remained a single line system. The Cooper introduced small, 7” disc brakes when the 997 was first marketed in 1961. The Cooper brakes changed slightly a couple of times including improved calipers for the 998 Cooper. The Cooper S from the start in March 1963, used the much better 7.5” front disc brakes (servo assisted ) with rear drums incorporating a spacer to match the front track increase of the discs. The Van was the second version of the Mini to be introduced when it appeared in January of 1960. It had the same longer wheel base of the later Estates and Pick-ups, but had the fuel tank under the rear floor right from the beginning instead of like the early Estates with the tank inside the car. Power was through the basic 848cc engine and gearbox with the magic wand shifter. The Van was a two-seater only, but for a while a rear seat conversion was available. The Van, like the Pick-up introduced later, had a one piece front panel with the grille part of the stamping rather than being a removable item. This continued right through the entire production run; although, it was not uncommon for owners to cut the panel out and replace it with a standard grille – either for looks or engine access, or both. Also, like the Pick-up and Estate, the Van retained the standard (“dry”) suspension, not converting to the hydrolastic (“wet”) suspension with the Saloons in September 1964. The Estate Minis (Station Wagons in US-speak) in the form of the Austin Seven Countryman and Morris Mini Traveller were introduced in September 1960, as the third body style to be released. These longer wheel based (LWB) Minis came with wood trim on the exterior and are commonly known as Woodies. Like the Saloons, the Seven name was dropped early during the Mk I run, and the Minor name was dropped at the end of the Mk I run. The earliest Estates had the fuel tank located inside the cabin behind the left rear wheel well. This was soon moved to an under floor position behind the rear subframe – the same place as used for the other two LWB Minis, Van and Pick-up, right from their introduction. By October 1962, the Estates could be purchased without the exterior wood trim making the cars cheaper, but they were still Countryman and Traveller depending upon whether Austin or Morris. The Estates followed closely the changes to other 848cc Minis of the period with the major exception being that they stayed with the standard (“dry”) suspension not converting to the hydrolastic (“wet”) suspension with the Saloons in September 1964. Following after the Estates, the Pick-ups were introduced in January 1961, as the fourth body style. They were the third long wheel based (LWB) Mini. Like the Estate and Van, the Pick-up used the 848cc engine and gearbox with the magic wand shifter. And like the Van, the grille was part of the front stamping and was not a separate piece. This continued right through the entire production run. Also, like the Estate and Van, the Pick-up retained the standard (“dry”) suspension, not converting to the hydrolastic (“wet”) suspension with the Saloons in September 1964. The Moke was the sixth body style (the Riley Elf and Wolseley Hornet were fifth) and was the last of the body style variations (until the 1990s Cabriolets – unless one wants to count the Clubman). Introduced in 1964, this was the shortest of the factory Minis (by ¼”!) and looked much like a Jeep run through the clothes dryer under too hot a setting! Under development almost from the very beginning of the Mini, it didn’t measure up to its designed task as a light military vehicle, but, once introduced to the public, it caught on as a cult car. The wheel base was the same as the saloons and the engine and transmission were the standard 848cc, magic wand arrangement. The Mokes were produced with the standard, dry suspension only. No conversion to hydrolastic was made. The Riley Elf and Wolseley Hornet Minis, the 5th body style, were introduced in October 1961. Under the skin there were no changes from the standard Saloon. Same brakes, same 848cc engine, same magic wand, 3-synchro gearbox, same suspension…and the same wheel base. These were not members of the LWB, long wheel base, club. Also, the two cars featured a wood trimmed dash (full in the Elf, just the center pod in the Hornet), partial leather seats (on all but the earliest of the Mk Is), and a front grille traditional to the older Riley and Wolseley marques. The cars were sold as up market versions of the Mini. Because of this, and the slight increase in weight, the brakes and engine were judged not quite up to the standards of the market for which they were aimed, so the Mk I quickly gave way in November 1962 to the Mk II. Only a year and a month (November 1962) after the first Riley Elf and Wolseley Hornet went on the market, the Mk II was introduced. Although many systems followed the trend of the main stream Saloon (conversion to hydrolastic suspension in September 1964, for instance), these two marques became a pioneer for many changes not to find their way onto the main stream Saloon until much later. The Mk II Elf and Hornet were badged as such – the first Minis to sport the Mk II badge. Brakes were upgraded to twin leading shoes, almost two years before the rest of the line, and the engine that was to power more Minis than any other was introduced: the 998cc engine. It didn’t show up in other Minis until 1967. The Mk II gave way to the Mk III in October 1966, so the Mk I and II Elf and Hornet came and went while the main stream Mk I Minis still had a year to run. In October 1966, the Mk III Elf and Hornet appeared. They sported the Mk III badge (on the boot) and were the only Minis to do so. Still in 998cc form, these cars continued to pave the way for later Minis. They featured roll up windows, fresh air vents, and had an option of a heated rear windscreen. The Elf and Hornet started getting the all-synchromesh gearbox with the rest of the Minis in August 1968, but they retained the smaller, main stream Mini rear window right through to the end. Because the Mk III Elf and Hornet spanned the main stream Mini Mk I and II runs (ending in August 1969 just before the Mk III main stream Minis were introduced) the earlier Mk III Elf and Hornet have more in common with the Mk I main stream and the later having more in common with the Mk II main stream. Sort of a Mk IIIa and IIIb! All of the body styles from the earlier cars carried over with some major changes, and the Minor name disappeared from the Morris Minis. The major changes from the earlier cars were a different shaped front grille (incorporating trim on the leading edge of the bonnet), a slightly bigger rear window, and larger, square tail lights. The bodies were adorned with Mk II badges and the earlier cars started taking on the Mk I name as a popular way to differentiate them from the Mk II Minis. The 997cc Cooper engine had been dropped during the Mk I run, as had the 970 and 1071cc Cooper S engines. Left were the basic 848cc as well as the 998cc Cooper and 1275cc Cooper S. Added to the line up was the non-Cooper 998cc engine in the Super Deluxe – the engine introduced originally with the Mk II Riley Elf and Wolseley Hornet way back in November 1962). The gearboxes were still non-synchromesh first gear until August 1968, when the 4-synchro began to be introduced, and, although the 998 used the Cooper-type remote shift, the 848 retained the magic wand shift mechanism. An often overlooked, but important change, was the introduction of a new steering rack and steering arms that finally made the turning circle smaller in keeping with the small size of the car. The change in steering, the square tail lights, the bigger rear window, and the new front grille shape remained with the Mini with only small variations until the end of production in 2000. All of the Mk II Saloons retained the hydrolastic suspension. All saloons except the Cooper S were replaced in October 1969, by the Mk III Minis. The Cooper S Mk II was produced through February 1970. The Estate inherited the 998cc engine and the Mk II grille shape, while the 998cc became an option for the Van and Pick-up. The Van and Pick-up retained the stamped in grille. This continued right through the entire production run. 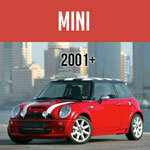 For the most part, other changes in these three types of Minis followed the Saloon. These long wheel based Minis stayed with the standard (“dry”) suspension. The Moke changed little (no 998cc option), as one would expect from such a utilitarian vehicle, but you could get it in white instead of only green! By October 1968, the English Moke was discontinued. Of the various body styles, with less than 15,000 produced, the only one made in fewer numbers is the 1990s Cabriolet. With the introduction of the Mk III in October 1969 (Cooper S in March 1970), the Minis underwent major changes. Note that the cars were not badged as Mk IIIs. In almost all cases, the Austin, Morris, Riley and Wolseley names disappeared from the Mini scene. The Marque simply became Mini. There were some exceptions. For example, English built Minis for the Canadian market retained the Austin name for several years, and Minis built in Australia continued on as Morris Minis for a while. The most noticeable features of the ADO20 Mk III Minis were the roll up front windows and the lack of exterior door hinges. The roll ups were not new to Minis. The Riley Elf and Wolseley Hornet had them by October 1966, and the Australians and South Africans had been building Minis with roll up windows for some time. But this was a major change for the main stream Mini. The English Moke was gone before the end of the Mk II minis, the Cooper stopped at the end of the Mk II Minis, and the Estate also disappeared in “round nose” form showing up in the Clubman line only durring Mk III time. In spite of the changes and the death of many former models (or maybe because of it) the peak sales years for the Mini were during the Mk III time period. See the Mini Time Line on the web site for details. Along with the roll up windows and lack of external hinges, the rear quarter windows were larger and the boot lid, swinging license plate mount went away with the rear plate now mounted right to the lid. For the most part, the interiors were similar to the Mk II, but the large front door pockets disappeared to make room for the roll-up window mechanism. The three engines left were the 848, 998 and 1275cc (Cooper S only) units. The 848cc still used the magic wand gearshift to start; although, a few special order 848s seem to have been made with remote shifts. The 998 and 1275s used the remote to start with. In January 1973, Mini gearboxes went to the rod change shift mechanism and that is the way they stayed until the end of production. Also, in January 1973, the Mini finally came with an alternator as standard. By April 1973, the two types of inboard U-joints had been replaced with the “plunging inboard CV joints” more commonly know as “pot joints.” They, like the rod change shift mechanism, remained with the Mini until production ceased. Braking continued with dual leading shoes; except, for the Cooper S which retained the 7.5” brakes with servo assist. Suspension on all but the Cooper S reverted to standard (“dry”) suspension. When the Cooper S went out of production in July 1971, hydrolastic disappeared from the Mini line and never came back. Also, when the Cooper S went out of production, the only 1275cc engine still available was in the 1275GT. The first of the “specials,” the Limited Edition, was issued by the factory in January 1976. It was basically a tarted up Mini 1000 (all for “show” and no extra “go”) and was the first of many such vehicles the factory built over the years. The Vans and Pick-ups followed the mechanical changes of the Saloons; although, in some instances a little slower. For example, the pot joints didn’t start showing up on these two LWB Minis until June 1973. The two engine choices (848 and 998cc) remained as did the sliding windows. The love-them-or-hate-them, “square-nosed” Minis in the Clubman line were introduced in October 1969, at the same time as the Mk III Minis. They were produced during the Mk III main stream cars' run and overlapped into the Mk IV Minis. The two saloons, Clubman and 1275GT, looked much like other Minis; except, for the extended and squared off front nose with rectangular grille and raised front bumper. Underneath they were, for the most part, the same as the main stream saloons, and the interior didn’t differ much with the notable exception of the gauges being moved from the center of the dash area to in front of the driver: two pod gauges for the Clubman and, with the addition of a tachometer (a first for factory Minis), three for the 1275GT. The engine, gearbox and other mechanical specifications were mostly the same as the main stream Minis with changes made during the years sometimes lagging a month or two behind. The 848cc engine was not a Clubman option. The 998 was used for all automatics. The 998 was also used for standard gearboxes up until October 1975, when the 1098cc engine finally made its appearance in an English built Mini body shell. The 1275GT used a 1275cc engine (no relation to the Cooper S 1275) in single carburetor form during its entire run. Both the standard Clubman and the 1275GT used hydrolastic (“wet”) suspension like the Cooper S until the Cooper S went out of production in July 1971. From that point on, all Minis were on standard (“dry”) suspension. The Clubman used the Mk III and IV Mini’s dual leading shoe drum brakes. The 1275GT used the Cooper S 7.5” discs (servo assisted) until mid-1974. Denovo safety tires were an option on the 1275GT by August 1974, and became standard in August 1977. The 7.5 imperial gallon fuel tank was fitted mid-1974. This was the first appearance in a Mini of the larger tank. At the same time 12” wheels showed up on the 1275GT along with the 8.4” front disc brakes and deletion of the servo. It was 10 years before the 8.4” discs made it as the standard Mini brakes! The Clubman Saloons were discontinued in August 1980. With their demise, the 1098cc engine disappeared from the Mini line forever, and the 1275cc engine was not used again until the introduction of the Rover Cooper RSP in July 1990. The Clubman estate took the place of the Austin Countryman and Morris Traveller Minis when introduced in October 1969. The wood siding option was gone. Instead you got vinyl covered metal around the belt line for a few years until a more pleasant stripe replaced the fakery. The same 998cc engine and transmission as the Saloon was used to begin with, and the dry suspension continued on this LWB, long wheel base, Mini. Like the Saloon, the 1098cc became standard in October 1975 unless an automatic was ordered. Then the 998 was used. 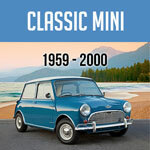 Other changes followed the pattern of the Clubman Saloon and Mk III Minis. The Clubman Estate was discontinued, in name only, in August 1980. It was renamed the HL Estate and was around until February 1982 (with a 998cc engine), when Minis of any name were no longer offered in an Estate version. What are commonly called the Mk IV Minis replaced the Mk III in May of 1976. They looked pretty much the same with the biggest change being the attempt to isolate the car’s body from road noise by using rubber mounts between the body and front subframe and increasing the size of the rear subframe rubber mounts. This succeeded to a small extent at some sacrifice to the handling. The extra sound deadening added in 1980 helped the cabin noise issue, too. The 848cc engine disappeared in 1980, except in the Vans, and the Vans and Pick-ups were finally discontinued in 1982. Since there were no official factory Mk IV Minis (don’t look for Mk IV badges!) some argue that the Mk IV ended earlier than 1984. October 1980 is one date. This would make the Mk V from 1980 to 1984 and slide the rest so that the last Minis were Mk VIII instead of Mk VII. It’s not worth the time to argue about. Here we will stay with the Mk IV through to 1984, and the Mk VII convention for the last Mark. Other changes over the Mk IV’s life were more evolutionary than revolutionary. Reclining seats made their appearance along with a reversing light and an inside, dipping, rear view mirror. The Clubman style gauges took over near the end of 1980 so another of the characteristics of early Minis was lost for good. In August 1979, the second special edition (and the first of the anniversary specials) made its appearance as the 1100 S LE or the 1100 Special. It was kind of a cross between a round nose Mini and a Clubman. The Clubman 1098cc engine made its only appearance in an English built round nose and the 1275GT’s instruments were used on the inside. Also, starting in 1979, the alphabet and name changes took off. The Mini 1000 became the Super. The City was introduced. The Super became the HL, or City. The City became the E. The HL to the HLE and then the HLE became the Mayfair all by October 1982. It was confusing then and is still confusing today! The next special edition showed up in October 1983: the Mini Sprite LE. (Not to be confused with the 1992 base model Mini also called the Sprite.) It was followed by the second of the anniversary specials, the Mini 25 LE in June 1984. The Mini 25 is important because it introduced the major changes that would be standard on almost all Minis from Mk V on, and really fits into the Mk V realm; although, the Mk IV Minis continued on until October 1984, when the 25’s introduced changes became standard. During the Mk IV time the rubber cone/spring composition was changed to make it softer. Foot pedals became larger with the throttle pedal now the size of the former brake and clutch pedals, and the brake and clutch pedals growing in size and changing shape to 6-sided. The single, multi-function stalk on the steering column gave way to twin stalks and by 1977 the square rear tail lights incorporated a backup light. Although the 848cc engine was dropped from the saloon line up by 1980, the Pick-up continued with it as an option until November 1980, and it was available in the Van right up until December 1982 when both the Van and Pick-up were discontinued. The first Mk V was really the Mini 25, the 25th Anniversary Mini, and it was introduced in June of 1984, but the big changes it brought to the main stream Mini scene didn’t get introduced until October 1984. The big changes with the Mk V were the 12” wheels, 8.4” front disc brakes and the flares/wheel arches needed to cover them. Nothing really new, but now these were the Mini standard. The only body style was the Saloon and the 998cc engine was the only engine option until the resurrection of the 1275 (related to, but not the same as either earlier 1275) with the 1990 RSP Cooper. Almost hidden among all the decal swapping specials was the fastest “production” Mini ever built. The ERA Turbo showed up in 1989 and by making use of a Garrett T3 turbocharger claimed top speed of 115mph and 94bhp. Suspension and brakes were beefed up; low profile tires and a special body kit were added. The bigger news, though, was the reintroduction of the 1275cc engine in A+ form and under the Cooper name. The Mini Cooper RSP was produced in very limited numbers starting in July 1990, but with the names Cooper and 1275 tied to the Mini once again, they were a big hit and the factory promptly released the Cooper as a regular model in September 1990. A special “S” version was available by adding a factory approved conversion kit starting in March 1991. Another interesting version showed up in the late Mk V range: the Lamm Cabriolets, in June 1991. Only 75 were built, but they were harbingers of things to come, not only for the introduction of the first factory cabriolet body style, but also for their 13” wheels. Count the end of the Mk V Minis with the end of the carb version of the 1275 Cooper in September 1991, and the end of the 998cc engine in the rest of the line in May 1992. Like the Mk V, the start of the Mk VI has some overlap with previous years. There is no one cut off date. By October 1991, the Cooper version of the Mini had incorporated the Mk VI updates while the main stream Mini didn’t pick them up until later. Admittedly, the Mk V to Mk VI change is a little fuzzy. Remember these changes are not factory changes – you won’t find factory listings for either a Mk V or MkVI. Even the Roman numeral labeling convention gets blurred. You’ll see Mk 6 written often, instead of Mk VI. The common way of cutting off the Mk V and starting with the Mk VI is to divide Minis into two camps: Cooper and non-Cooper. The Mk VI Cooper starts in October 1991, when the carb version was dropped and the SPi (single port) throttle body injection/fuel injected engine became standard. A catalyst was introduced at the same time. The other branch of the Mini family, the non-Coopers, went to a Mk VI in May 1992, after the demise of the 998cc engine in April 1992 and the introduction of the carb 1275 as the base engine. The Mayfair and the Sprite (not a special edition car, but the name used for the City replacement) both used the 1275 equipped with a catalyst. Cooper Minis were carb during Mk V time. Changed to SPi in October 1991 (Mk VI). Non Cooper Mk VI started as carb and didn’t change to SPi until August 1994. On the Cooper side of things, there were many changes during the Mk VI time frame, almost all of them having nothing to do with performance. Interiors changed. External colors varied. Lights were added. Wheel options added. Alarms. Locking wheel nuts. In car entertainment. Internal bonnet release. And more. There was an Italian Job addition one could order: some lights, bonnet stripes and a boot liner (to hold all the gold?). Then an RAC option: sunroof, mud flaps and tinted glass. As far as performance was concerned, early on there was a factory warranted conversion offered for the Cooper making the car an “Si” and dropping the 0 – 60mph time by 1.5 seconds and upping the top speed by 8mph. In July 1994 (some sources say January), the factory issued the Mini Cooper Monte Carlo SE to trade on the Minis famous Monte Carlo victories…three decades before. Then the Mini Cooper 35 LE was issued in 1996 as a Cooper anniversary edition celebrating the first Cooper’s introduction in 1961. Lots of retro styling touches, but underneath it was just a late model Cooper. The Mayfair and former City, now the Sprite, followed the Cooper trend of making interior and exterior changes, adding security, and making little if any changes in the way of performance. Although produced in small numbers, an important model was introduced in this period of time: the Rover Mini Cabriolet, a logical progression from the Lamm Cabriolet of June 1991. The Rover version, announced in late 1992, was available in July 1993. If you don’t count the very limited edition cabriolets via Lamm this was the first new body style since the Clubman’s debut in 1969. Based on the SPi Cooper it featured a special body kit and an upgraded interior. About 1100 were built. The Mk VI run ended for all the cars in August 1996. The last big changes to the Mini line were due out in October of that year. The big change in the Mk VII was the introduction of the twin-point (or multi-point) fuel injected engine. The MPi also did away with the distributor and moved the radiator to the front (except for Japanese market cars). A driver’s side air bag was added along with door side impact beams. The Sprite was gone, and the Cabriolet was gone. Left were simply the Mini and the Mini Cooper. The final drive went to a very high 2.76:1 in the manual gearbox allowing much lower rpms for highway cruising, and the automatic was dropped from production. Over the years there were many variations in dress up options and the Mini (especially with the lack of an “entry level” model) had drifted far from its original roots. A good example is the Sports Pack version offered first in 1997. This ultimate in “bling” added, among other things, huge tires on 13” x 6” wheels and covered them with very wide flares/wheel arches. The front wheel wells had to be cut to clear the huge tires and a limited movement steering rack had to be used to keep them from rubbing on turns. All these additions allowed you to own a car to show off but one that dropped 6 mph in top speed and was over ½ second slower in 0 – 60 time. Fashionable form over function. In April 2000, the last specials (or variants?) were offered: Se7en, Cooper and Cooper Sport. A luxury version for the German market was also produced, the Knightsbridge. The Se7en look was made to recall the car’s earliest days. The Cooper wasn’t much changed from other Coopers of the Mark, and the Sport offered some upgrades that had nothing to do with performance: polished alloy gear knobs, and black leather dash tops, for example. In October 2000, the 42 year run of continuous production ended. 64cooperman, some of the early Minis had a stamped Chassis Number on the front floor...but very few. The aluminum plate was usually all there was. a very basic question- on early mark 1 cars one can find a stamped # on a sheet metal brace if you know were to look. Did they move the stamped # or do away it ? let's say you want proof of a 1967 cooper S and you can't believe the little screwed on riveted on id plate. where does one look ? Phil, This would be a good question to post on the Mini Mania Forum. Thanks Cheleker, I located the vin in the lip of the bonnet aperture as advised. From Parnell's, "Original Mini Cooper and Cooper S", Published in 1993: "The VIN is found on a plate headed 'Rover Group Limited' and fixed to the right-hand wing valance, together with three-letter codes for paint and trim colours and permitted weights in kilograms (not usually quoted on home market cars). The VIN is now also universally stamped into the actual bodyshell structure, in the lip of the bonnet aperture on the leading edge of the scuttle. For the 1993 model year, all Rover Group cars also have an additional VIN tag which is affixed to the top of the scuttle so that it may be read from outside the car through the windscreen." Odd place to post such a note. Nothing to do with the article and a limited audience! I suggest you post on Mini-related Forums in whatever area/country you live. Should fit the same, but the earlier door won't have the door beam. This is a question better asked on the Mini Mania Forum. If anyone has a 1997 to 2000 sportpack mini LHD with a sunroof I would be interested ! Sounds like a nice daily driver .